Why does the BBC waste your money on so many weather forecasters? Perhaps it’s because the BBC extort money from the British public under threats of fines and prison! Am I the only person to find it immensely irritating that every evening at the end of the News At Ten on BBC1, there are two – yes, two – weather forecasts straight after each other? First, viewers in each of the Corporation’s 12 English regions and Scotland, Wales and Northern Ireland are given a separate forecast for their particular area. Then on comes another presenter, standing in front of near identical weather symbols, giving all viewers across the country a national overview based on exactly the same information. The pictures here show 12 forecasters on air at the same time last Wednesday night delivering separate reports to the BBC’s regions. Alas, this superfluity of forecasters doesn’t mean predictions are any more accurate. On Saturday they warned of storms sweeping through London between 4pm and 6pm. This led to Heathrow Airport cancelling 20 flights. But the havoc never happened. The deluge hit the West Country and the Midlands instead. At a time of austerity, when the Culture Secretary has indicated he is prepared to be radical in reconsidering BBC funding, claiming many families find the annual £145.50 licence fee ‘a lot of money’, how much do all these weathermen — and women — cost? Strangely, I have discovered this is confidential information. 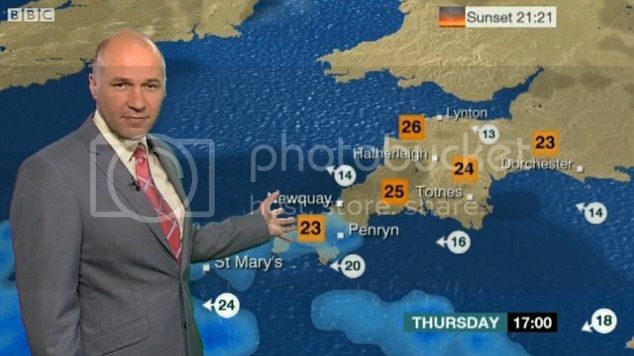 The number of weather forecasters and presenters employed by the BBC is, apparently, a secret. After asking the BBC how many weather forecasters it has, I eventually got the answer that it employs no fewer than 19 ‘network’ (ie national) forecasters, of which six are part-time. It also employs, at Broadcasting House in London, 13 production staff used for compiling weather forecasts. In addition, there are two managers and four forecasters at Broadcasting House who are directly employed by the Met Office, which has the contract to supply BBC weather forecasts. But what about the BBC regions, which produce local forecasts that duplicate the information? The Beeb simply refused to tell me how many regional forecasters it employs (The so called ‘public’ broadcaster). The regional weathermen for Cardiff and Northern Ireland are employed by the Met Office, but all the rest are presumably BBC staff. 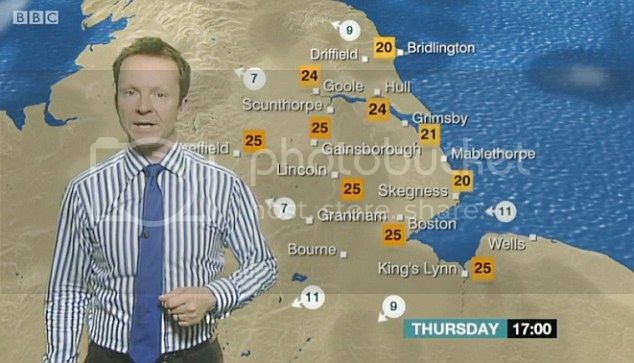 One licence-fee payer from the North-West complained on a viewers’ online forum that he has counted nine weather presenters in his area giving the regional forecast over recent weeks. Goodness knows how many that means we’re paying for across the country. Nor will the BBC reveal how much of our licence money it pays to the Met Office. Undeterred, I filed a Freedom of Information request, the Government’s attempt to give the public the right to see information held by public sector organisations. The official response was extraordinary: ‘The information you have requested is excluded from the [Freedom of Information] Act because it is held for the purposes of “journalism, art or literature”. It was designed to protect investigative journalists at the BBC from having to compromise their sources. It was not intended to stop a publicly funded organisation to shelter details on its finances that are of interest to licence-fee payers. The only fact we are allowed to be told is that in 2010, the Met Office (funded by the Government) won a five-year contract to continue to supply weather forecasts to the BBC. Neither the BBC nor the Met Office will disclose what the deal is worth, who else (if anyone) bid for the contract or why it was awarded to the Met Office. So, we have a publicly funded state broadcaster spending public money for a service provided by a publicly funded organisation. But the public has no way of finding out whether its money is being spent properly! In the Met Office’s annual report, the fees received from the BBC are lumped together with £32.5 million that the Met Office earned from providing services to ‘commercial’ organisations. As for the Met Office, it was reformed in 2011 and became a so-called ‘trading fund’ within the Department for Business, Innovation and Skills. This means it is required to operate on a commercial basis — marketing and selling its services. The idea was that the Met Office would earn its keep by selling its services to commercial companies such as ice cream manufacturers and clothing companies who need expert forecasts to plan production levels. However, the Met Office’s income for its services from the commercial sector for last year was just 15.8 per cent of its total revenue. And that includes money from the BBC. Meanwhile, the lion’s share of the Met Office’s annual income — £171.7 million last year — came from selling its services to other arms of government, such as the MoD, for whose custom it does not have to compete against rival firms. Elsewhere, its services don’t seem as popular. Tesco, Sainsbury’s and several other large retail groups use Metra, an offshoot of New Zealand’s national forecasting service. Others have given contracts to the Meteo Group, a joint venture between the Press Association and the Dutch national weather service. Most hurtful to the Met Office, Meteo provides forecasts for Devon County Council — which is based in Exeter, the city where the Met Office has its headquarters. No wonder, after a series of forecasting blunders: the infamous prediction of a ‘barbecue summer’ in 2009 (when rainfall was well above average for most of the UK) and its failure to foresee the coldest December in 300 years in 2010. And yet the Met Office is allowed to assess its own performance, a rare privilege for a public body. It frequently claims accuracy levels of 80 and 90 per cent — but only to forecasts up to 48 hours ahead. Even then, a forecast within two Celsius of the actual temperature is regarded as ‘accurate’. The Met Office does not publish any assessment of the accuracy of its five-day forecasts. Regardless, its chief executive, John Hirst, was paid more than £185,000 last year. The Met Office can still rely on its cosy BBC contract, which entails such a downpour of weathermen and women across the country. Admittedly, soon after its contract with the BBC was awarded in 2010, the Corporation announced cutbacks. Weathermen Rob McElwee, Philip Avery and Tomasz Shafenaker were told they would be moved behind the scenes. 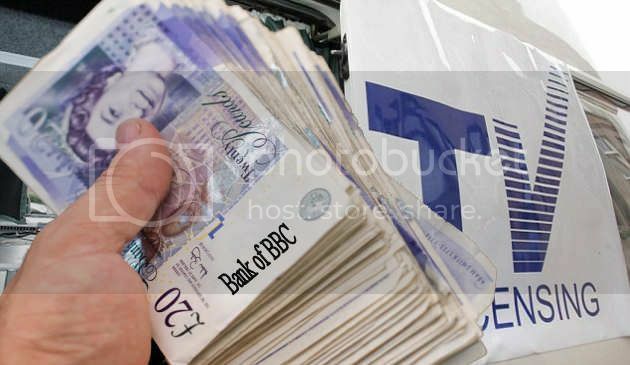 A reduction in presenters, the BBC said, would ‘deliver greater benefits to the licence fee-payer’. Yet it continues with near-identical weather forecasts, one after the other, every night with different presenters. What’s more, there is much geographic overlap. For example, the weather map used for the BBC Midlands region also shows large areas of Wales, the South-East, East Anglia and the North — all of which have their own forecast. London has its own weather forecast despite being only 30 miles across. The BBC has a weather website — yet the Met Office has its own website that puts out pretty much the same information. Indeed, at the bottom of the BBC forecast, it reads ‘in association with the Met Office’. If the BBC is serious about not wasting licence-fee money, why can’t it just incorporate weather forecasts from the Met Office site? After the weekend’s sultry weather, one forecast is for certain: there will be a lot of duplication and waste of money appearing on your TV screen this evening.